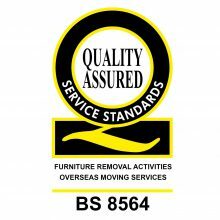 Kilmarnock Removals International are recognised as one of the UK’s top overseas removal companies. Our standards are nothing short of exceptional. As a member of the elite BAR Overseas Group, we set the benchmark in overseas removals. Few things in life are as stressful as moving home and it’s no wonder those pressures can intensify when it involves moving to another country. Moving overseas is a major life-changing event, and moving your belongings with Kilmarnock Removals International means one less thing to worry about. Huge task and handled extremely well by all men concerned. Many thanks. Kilmarnock Removals International are an award-winning international removals company. Moving overseas is a major life-changing event, and we have the skill, expertise and experience to make sure you get there with the minimum of fuss. 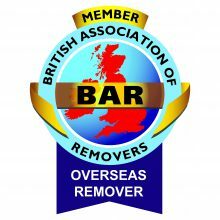 As a member of the elite BAR Overseas Group, we set the benchmark in overseas removals. Our comprehensive service is available anywhere in the world, and we can even organise air freight transport when time is of the essence. We use trusted, experienced overseas partners to ensure your move is handled with care at every stage of its journey. Committing to annual inspections to ensure strict standards are met, Kilmarnock Removals International offer a personal and professional removal service no matter the distance. To make your overseas move as seamless as possible, it’s best to get us involved early in the planning process. We can help you plan for customs regulations and the most economic method of shipment to make sure your belongings arrive at your new home when you do. Kilmarnock Removals International has put together handy guides (right) with information about customs regulations and imports information.